Penelope’s taste profile is heavily reliant on the Wheat and Rye grains being uniquely aged separately with corn/barely grains in new charred American Oak barrels to maximize flavor. Penelope Bourbon is non-chill filtered.TASTING NOTES:Aroma – Corn grain dominant sweetness, sweet cream, slight butterscotch, hints of spice, smoke, and mint. Forward Notes – Corn grain sweetness, sweet cream, roasted nuts. Body Notes – Slight pear and orange zest, spice, cream, roasted nuts. Place mint and simple syrup in glass. Muddle well to dissolve the sugar and to release the oil and aroma of the mint. Add the Penelope Bourbon and peach liqueur. Stir well and serve over crushed ice. Garnish with mint sprig. 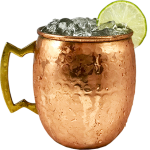 Pour Penelope Bourbon and lime juice into copper mug or a highball glass. Fill the mug or glass with ice and top with ginger beer. Garnish with a lime wedge. 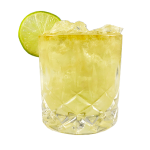 Squeeze half a lime into a highball. Fill the glass with ice, add the bourbon, and top with club soda. Stir and serve. Garnish with lime. 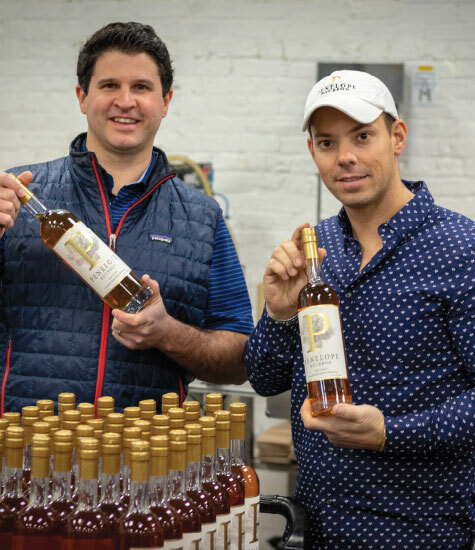 Penelope Bourbon is a company that was crafted in the classic entrepreneurial tradition. Mike Paladini teamed up with his life long friend and childhood next door neighbor, Danny Polise. Both grew up in Basking Ridge, NJ. They began to embark on creating the highest quality Bourbon that everyone could enjoy and love. Both found out in 2018 that their wives were expecting. Mike found out that his wife and him were having a baby girl. Her name would be Penelope. The day he found out they were having Penelope a light bulb went off. Mike wanted to bring together two things he loves so dearly – his soon-to-be baby girl Penelope and Straight American Bourbon. A company was born. We believe that a team should be, well, a team – collaborating and working together to achieve good things. We think it’s the best way to work, and the most fun. From our founders to our Penelope Bourbon Ambassadors to our newest hires, we’re an eclectic group of Bourbon lovers, weekend warriors and food enthusiast, and we wouldn’t have it any other way. Our mission is to provide our customers with the highest quality Bourbon at the best possible price. Our Four Grain Straight Bourbon blend provides an unforgettable taste without breaking the bank. We sourced the finest grains available to provide a world-class taste profile. We do this by uniquely aging our Wheat and Rye grains separately with our Corn and Barely grains in new charred American Oak barrels. Our Bourbon is proofed down to 80 so our customers can enjoy a lighter Bourbon without all the unnecessary calories. Penelope Bourbon is under 100 calories per 1.5 ounce serving size. The Penelope Bourbon label was designed and created solely by Mike and Danny. We love it for its simplicity and authenticity—two elements at the core of everything we do. Can anyone guess what type of flower is behind the P? Interested in being a Penelope Bourbon Brand Ambassador? Join the Penelope mailing list to keep up-to-date with our latest releases, special offers and upcoming events.